Touchdown! 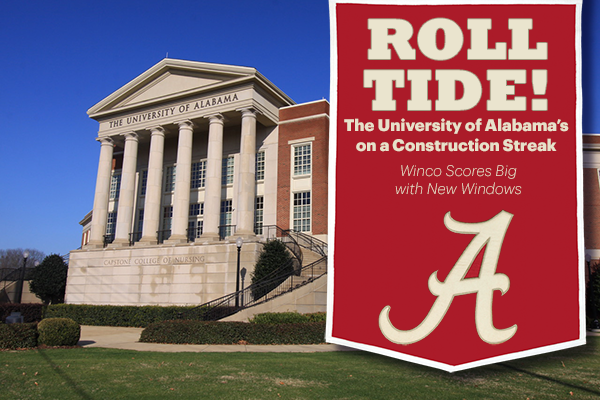 Winco has been scoring big at the University of Alabama for more than a decade. We've installed new windows on more than 23 new construction buildings on the University of Alabama's rapidly expanding Tuscaloosa campus. So much construction is a testament to the incredible growth and popularity the university is currently enjoying. Most of the University's new buildings maintain the school's iconic Southern plantation style with red brick exteriors, limestone trim, and plenty of large, single hung windows. Winco created a special window for the university to reflect the heavily trimmed wood of old Southern mansions. Winco's 1450S offset fixed window is a simulated hung window with a beveled frame that recalls the graceful appearance of historic windows used throughout the South. All of the windows provided by Winco feature custom panning systems of oversized aluminum extrusions covering jambs, sills, and head jambs. Among the new buildings that the University of Alabama and Winco have completed on campus are Science & Engineering, Presidential 2 Tower, Chancellor's Hall, Ferguson Hall, and Moody Music Hall. "All mirror the same legendary Southern charm," says Marty Colby, Winco's sales rep on the job. Whether building new construction or renovating older buildings, Winco Windows offer historic style with high performance. Visit www.wincowindow.com for more information.